I’m writing this from the Wembley Golf Complex. This is my first time here, and it looks incredible, especially for a public golf course. 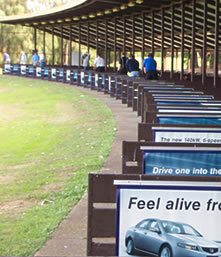 It boasts a modern 30 bay automated driving range, large spacious pro shop, tavern and two courses. I’m here because I’ve decided that I want to get better at golf. I played a round last week with my dad and a friend, and I wasn’t great. I highlighted two things that I need to improve in. I’m inconsistent with my swing. Sometimes I’ll hit a dead straight shot, while other times it will swing to the left or right. For me to get any better these are two things that I can work on, and reduce my round score. Part of the reason I want to get better is that I’ve been looking for a sport to be involved in since I injured my knee. Without surgery, I’m unlikely to play basketball again. However, golf is a lot less intensive, but will still give me a good amount of exercise. But if I’m to play regularly, I want to be able to join with other players and not slow them down. In order to do that, I need to improve my game. So my plan is to head to the driving range each week and do some serious work on my swing. $20 got me just over 100 balls, which allowed me to take more shots than I normally would in a round, for about the same price. Following that, I do some putting practice, and then some chipping and bunker work. Today, I just came down and hit, but next week I’ll be prepared so that I can take some notes to see how I’m progressing. Things such as which way my shots are tending to go, how many putts I’m sinking, etc. That way I can see my progress. I see many parallels with my violin practice. For example with my putting practice today. I started out with a distance of one putter (about 1m). I took 4 balls, and kept putting until I sunk all 4, twice in a row. Then I moved to two putter lengths. This is like metronome practice: you start at a slow tempo, then when you can play it correctly a few times in a row, you make it faster. I also know that like with music, you need to have a deadline to work towards, or you’ll be working with no urgency. One of my mates has won a round of golf for four (and lunch) at the Mt Lawley golf course, one of the prestigious private golf clubs in WA. He’s planning to play the round sometime before February, so that’s my deadline. I have to be hitting more consistent and making my putts in 2 or less by the end of January.